Spotted hyena (Crocuta crocuta) is a widely known character in animal television channels and cartoons. And from now on you might have the chance to “spot” this amazing creature at the African Animal Area in Taipei Zoo. Spotted hyenas are very vocal animals which produce a number of different calls. A kind of their voices is pretty much like human’s laughter. This is the reason why the spotted hyenas are also known as laughing hyenas. Spotted hyenas are neither cats nor dogs. They are the carnivorous mammal of the family Hyaenidae. Spotted hyenas and lions are both apex predators in Africa. In areas where the two species are sympatric, occupy the same ecological niches, are thus frequently clash with one another over the competition for food and territory. There are two spotted hyenas in Taipei Zoo. The name of the female spotted hyena is Xiao-guai, which means “well-behaved” in Chinese. And the name of the male spotted hyena is Xiao-bai, which means “the white” in Chinese. 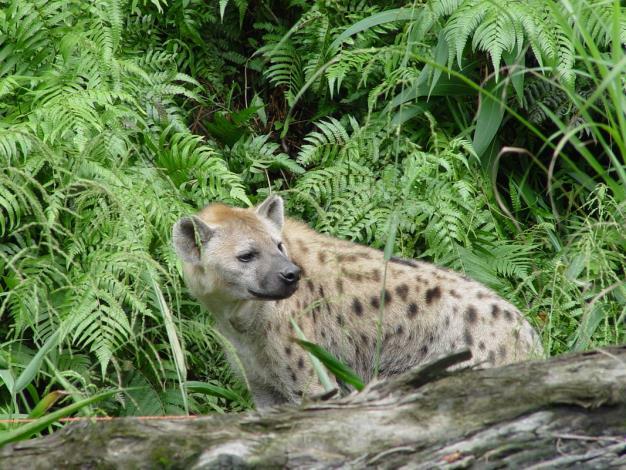 Spotted hyenas are nocturnal animals. If you are able to see them in the daytime, then you must be a very lucky person.